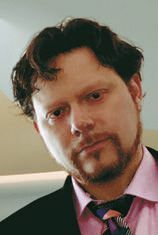 “The truth about stories is, that’s all we are.” Thomas King, The Truth about Stories. Buildings tell stories. Buildings express the combined will and intention of the broad community that come together to make them. They tell the stories of the people who desire them, the people who pay for them, people who design them, people who make them and ultimately, people who inhabit them. Buildings tell the stories of who we are and who we desire to be. Few buildings are as clear about its stories as the Gordon Oakes Red Bear Student Centre at the University of Saskatchewan. 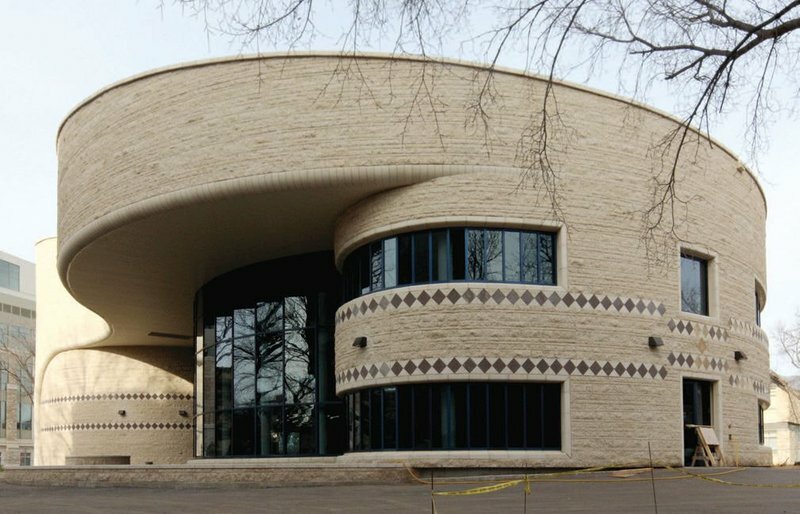 Stories of Indigenous knowledge, told in a building, told in stone. Beginning in 2007, the University of Saskatchewan (U of S) hired the architectural team of Douglas Cardinal Architect and RBM Architecture to design a stand-alone building to house the Aboriginal Student Centre and other services for First Nations, Metis and Inuit students. President Peter MacKinnon personally shepherded the project forward, participating in the steering committee decision to locate the building at the heart of the campus. The conception was to bring Indigenous knowledge to the center of campus life. This decision was reinforced with the naming of the building as the Gordon Oakes Red Bear Student Centre, intentionally welcoming all students. 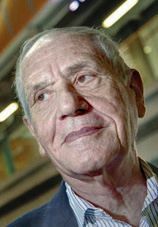 Gordon Oakes was an Elder and friend of the U of S, dedicated to education and welcoming to all. He often spoke of culture and education as a team of horses, needing both to succeed. Core to the design is the use of stone masonry to tell the stories and make Indigenous teachings present for all students on campus. The basic form is a sculptural expression of organic architecture, signature to the design of many Douglas Cardinal buildings in capitals across North America. 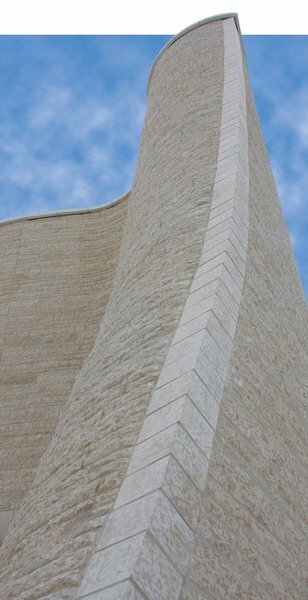 Buff limestone from Tindall, Manitoba is used to express the form, balancing the contemporary and dramatic architecture with a timeless quality. It is designed as a lodge, expressive of the spiritual buildings for indigenous cultures. Varied limestone coursings wrap to protect the north, opening to the south consistent with traditional lodges of the area. The opening to the south is protected by a massive cantilevered canopy, further enhanced by the suspended limestone above it. 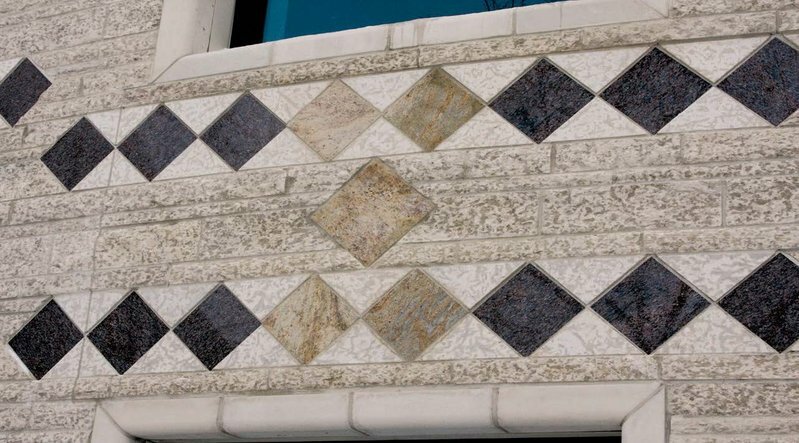 In addition to the timeless quality of the limestone in the design, the buff colour also tells the story of the building as a buckskin blanket. A mother protects the building from the cold north wind opening it to the warm south sun. This story is reinforced with the decorative stone beads. Natural coloured granite is used in each of the four directions, reflecting colours of the Gordon Oakes family. Purple-grey granite fills in the rest of the design, with the colour chosen to match the colour of Wampum, a shell product used for 1000 years as a gift and for belts of treaty and prophesy. Yet another story told by the stone is the contrast of buff limestone with blue glass and blue anodized aluminum frames. In story and symbol, these elements evoke grandfather stone and grandmother water, the elements of the sweat ceremony. Stone was not the only choice for the building. The original design was conceived in stone. The U of S has a standard of choosing limestone or fieldstone. Construction cost tendered higher than estimated due to the timing of a very hot construction market. Cost savings were explored in all parts of the building. The project team was asked to justify cost of stone masonry. Building components were considered for their net present value, a calculation that considers the money required to be invested today to replace elements of the building within its lifecycle. 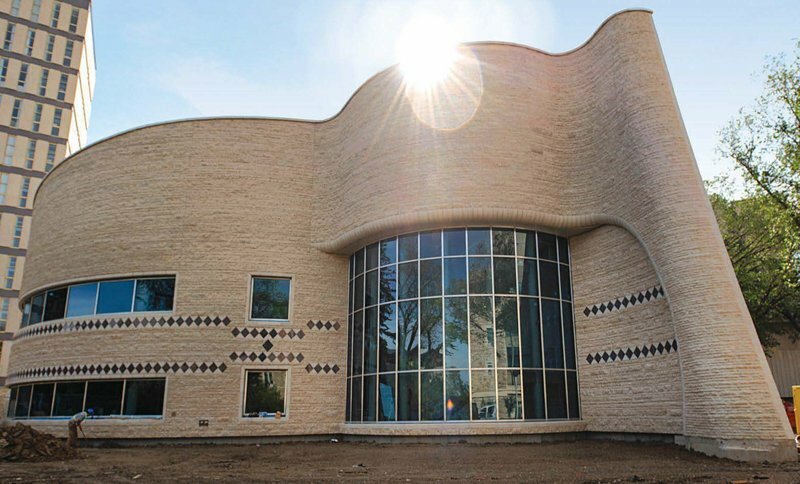 With U of S planning buildings for 100 years of use, stone proved to be the most cost- effective material compared with other exterior envelope solutions that would need to be replaced during the planning horizon. This consideration, coupled with the sustainable value of this durability, low carbon footprint and local material qualification returned stone to the clear choice for the Gordon Oakes Red Bear Student Centre. Masons battled the optical illusion of the toe out that occurs when looking down a single section of a larger overall curve. They were careful to not be drawn in by it and to keep each course in each section a continuous part of the whole. Purple grey Brazilian granite beads, 11" x 11", become a belt around this student center for indigenous cultures, those first settling in America. The granite is reminiscent of Wampum, a polished shell product used for as money, gift, trade and and decoration. Wampum was also used for pre-contact Belts of Prophesy and Belts of Treaty by native Americans. In order to complete the building design envisioned, many of the details required input from the whole team to realize, as some elements were the first time such forms had been built. For example, the canopy and sculptural forms are edged with large blocks of cast stone, skillfully suspended by the masons on a hidden steel suspension system. A close working relationship was developed between Douglas Cardinal as the designer, Paul Blaser of RBM Architecture as the detail architect and onsite lead, and Luc Durette and Jerett Bergovich of Scorpio Masonry as the mason contractor. Pooling their experience and knowledge, the design evolved as construction proceeded, achieving a result that was only possible with a team effort. Other examples included the construction of the leading edge of the sculpture, with the masonry corbeled back in a dynamic curve in both directions. Experience, innovation and cooperation were brought together with Scorpio Masonry completing a masterful solution to match the design. 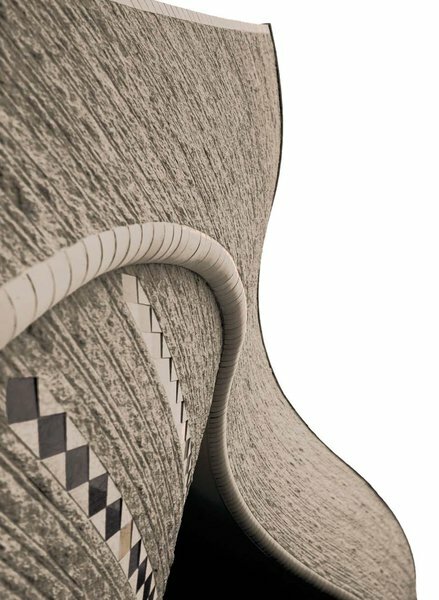 The result is an elegant, sculptural building that embodies layers of Indigenous stories to the university. These are some stories of this building. They are stories in stone that demonstrate how masonry continues to be a material of dynamic form, of contemporary expression and of timeless presence. Above: The form of the stone wraps the building like a mother draped in a beaded buckskin blanket, protecting from the cold north wind and opening to the warm southern sun. Left: The Sculptural form of the building is rooted in organic form. Rooted in the ground. Reaching for the sky. Below: The form of the building was always conceived as stone. Design models showed how stone gave the dynamic form a timeless quality, helping to make a building that feels part of the natural world. The Gordon Oakes Red Bear Student Centre is designed as LEED Platinum. Tyndall stone was quarried regionally in Winnipeg Manitoba contributing toward Materials and Resources credit, regional materials category. Stainless steel stone anchors manufactured regionally in Edmonton Alberta contribute toward optimizing energy performance as they give the insulation a snug fit and do no3t allow energy to escape minimizing any heat loss. They are also stainless steel as a poor conductor of energy and slotted to minimize thermal bridging. Thermal mass contributed by the stone also allows a smaller HVAC system.